Hi! 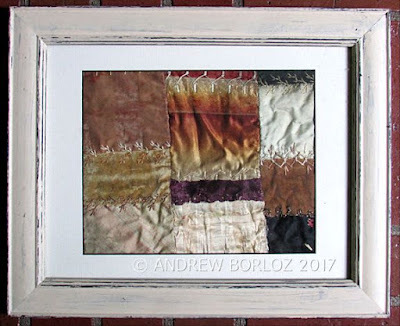 I'm Andrew Borloz and I am honored to be today’s guest artist. 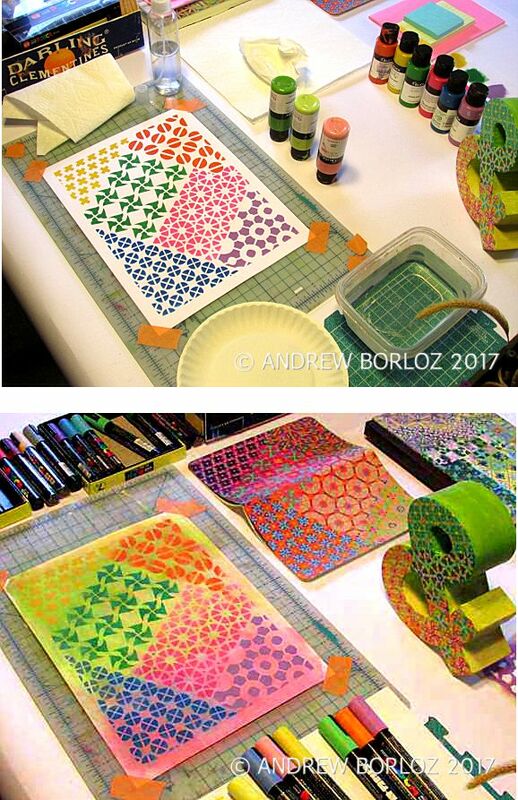 For this post, I have decided that I would like to show you how I was inspired to create the latest stencil design series, Crazy Quilt. Years ago, I bought a piece of an antique hand-sewn patchwork that was most likely cut from a crazy quilt, not knowing that I would create the crazy quilt stencils years later. I found it in an antique shop in Paso Robles, California. Last year, I was creating postcard-sized artwork by up-cycling the advertising postcards that came in the mail almost daily. I used all kinds of techniques and media for creating over 160 postcards, and stenciling was one of them. It looks like I have unconsciously created my own techniques for creating crazy quilt look with stencils and paint markers, not knowing that I would later create new crazy quilt stencils. I love to create patterns and experiment with them using different colors and shapes. 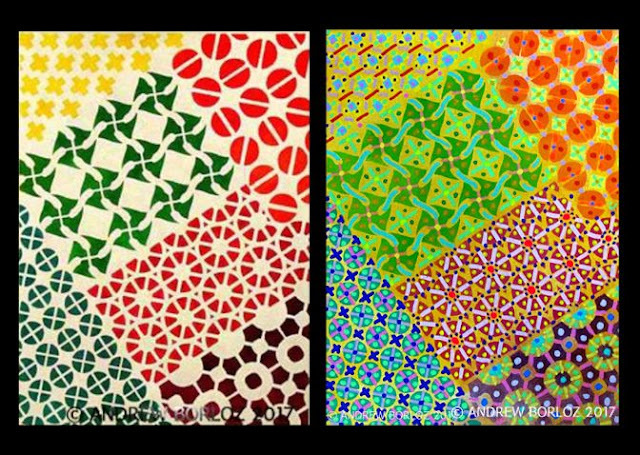 Last year, I was using my own stencil designs on one discarded painting found at an art school, and at the same time I didn't realize I was actually creating crazy quilt pattern. Not only that, I was using paint markers to create additional touches, making each pattern look more like the prints used for most crazy quilt. After it was done, I cut up the stenciled canvas for use as book covers (shown in photo below). I enjoyed the process so much that I used the same process again for the papier mache ampersand, journal book, prayer flag and decorative paper. 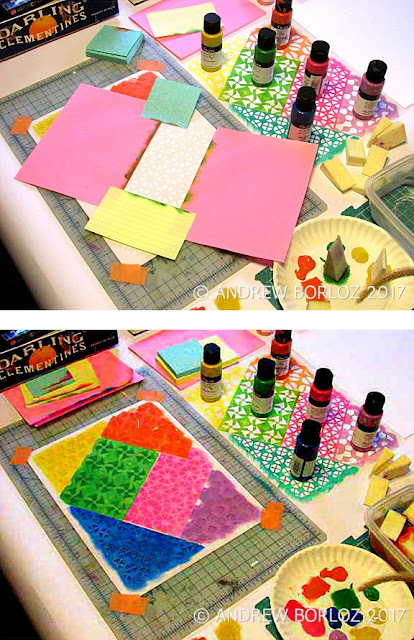 Someone saw the end results of my crazy quilt creation process and requested instructions on how to create them. Well, I was using at least 6-7 different designs and they can be quite expensive. Not only that, the process that I used was quite complicated and hard to show in a short time. So, I thought that maybe it would be a good idea to create several crazy quilt stencil designs so that the users will have to purchase one to three stencils instead of 6-21 stencils. 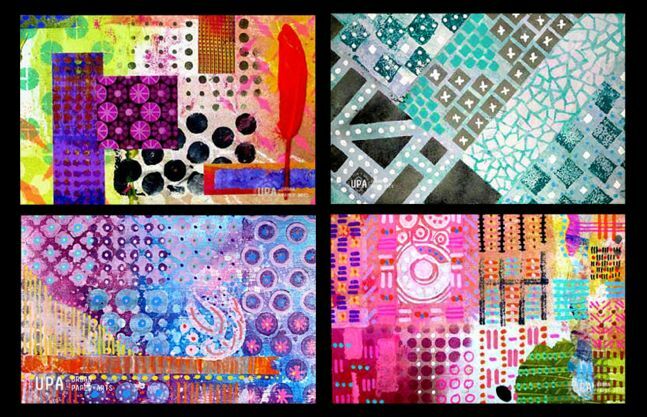 These were based on the original designs above that I created with multiple stencils. that's what I am going to show you here. 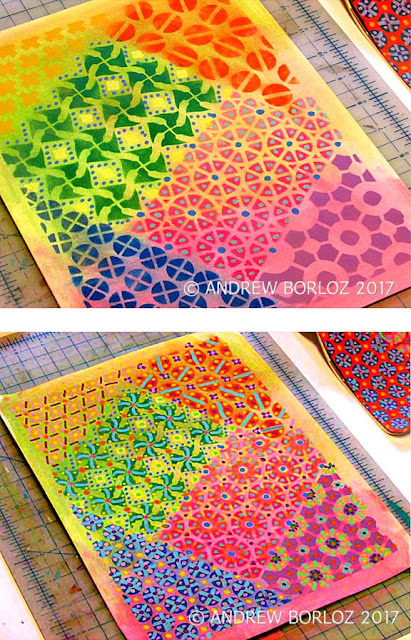 There are different ways to create the crazy quilt patterns with my stencils, but I will show one of them here - a three step process. Shown below are the first step (left) and the last step (right) of the stenciling & detailing process. Step 1: I used sticky notes to mask out other patterns while stenciling one individual pattern at a time. Step 2: A resist technique is utilized in this next step. I used light color for the background by slightly diluting the acrylic craft paint with water and applying it on the whole surface. I then immediately wipe the paint off with slightly moist paper towel. Step 3: After the paint is completely dry, I filled in the spaces (both stenciled and un-stenciled) with details using Posca paint markers (or any other brand) - broad and fine nibs were used. The details can be dots, lines, or shapes of your choice. Thank you for stopping by. 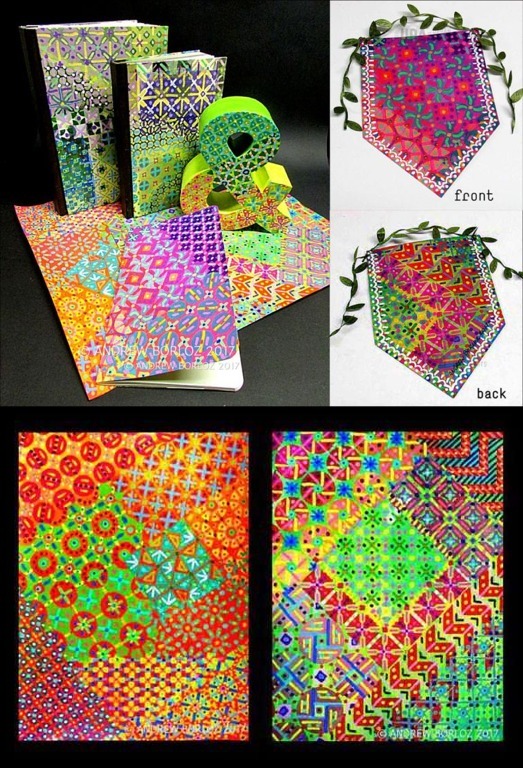 I hope I have inspired you to try one (or all) of the Crazy Quilt stencils. Perhaps you might come up with a new technique or process for using them. If you're using one of them in your art work, I'd love to see it! Thank you soooo much for the quiet video. And my favorites...postcards paint markers. Lots of possibilities there. So glad that you enjoyed the video! So cool! Great video Andrew! Thanks so much, Andrew!!! Great video! I loved your techniques!! You are so welcome, Carole! Glad you enjoyed the video. What a terrific tutorial. Thank you. Gorgeous! Thanks for sharing your process! I just got one of the CQ stencils to play with. You are so welcome, Amy, and thank you for purchasing one of CQ stencils! I just got one of the CQ stencils to play with. Yah! I hope you will have a lot of fun with it, Roth!